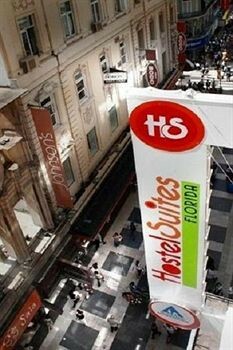 Property Location With a stay at Hostel Suites Florida, you&apos;ll be centrally located in Buenos Aires, steps from Mitre Museum and Police Museum. This hostel is close to Plaza de Mayo and Obelisco.Rooms Make yourself at home in one of the 92 air-conditioned guestrooms. Complimentary wired and wireless Internet access is available. Private bathrooms with shower/tub combinations feature deep soaking bathtubs and rainfall showerheads. Conveniences include desks and a turndown service, and housekeeping is provided daily.Rec, Spa, Premium Amenities Don’t miss out on recreational opportunities including a nightclub and bicycles to rent. Additional amenities include complimentary wireless Internet access, concierge services, and a television in the lobby. Getting to nearby attractions is a breeze with the area shuttle (surcharge).Dining Satisfy your appetite at the hostel&apos;s restaurant, which features a bar. Dining is also available at a coffee shop/café. Quench your thirst with your favorite drink at a bar/lounge. A complimentary buffet breakfast is served daily.Business, Other Amenities Featured amenities include complimentary high-speed (wired) Internet access, a 24-hour business center, and dry cleaning/laundry services. For a surcharge, guests may use a roundtrip airport shuttle (available on request) and a cruise ship terminal shuttle.